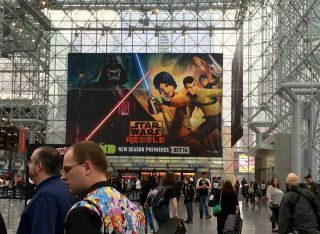 Star Wars Rebels" made an appearance at New York Comic Con to generate hype for the animated show's second season, premiering Wednesday (Oct. 14) and packed with action and fan-favorite characters. NEW YORK -- You don't have to wait for December's "The Force Awakens" film to get your "Star Wars" fix — Season 2 of Disney XD's "Star Wars Rebels" premieres tomorrow! Cast members and creators previewed the twists and turns of the animated TV show's second season at a New York Comic Con panel Thursday (Oct. 8). "Star Wars Rebels" tells the backstory behind the Rebel Alliance, which was portrayed in the "Star Wars" movies (14 years after the events of "Star Wars: Episode III"). It's a successor to the "Star Wars: The Clone Wars" animated movie and series. The Comic Con panel featured executive producer Dave Filoni and several actors, including Taylor Gray, Ashley Eckstein and Sarah Michelle Gellar (playing a major new villain for the series, the Seventh Sister). The audience got to see some clips of the cast in action, but these segments always seemed to cut off just before the big fight scenes would begin (prompting many cries of frustration). The series is exciting, panelists said, because it has the opportunity to show well-known characters from other "Star Wars" properties growing and changing over time: coming into their own as mentors or villains to the next generation of heroes. Many of the biggest cheers came in response to fan-favorite characters' appearances (which can also be caught in the newly revealed trailer). The show is coming back for a full, 22-episode season. For those who missed the two new episodes screened later that day at Comic Con, the show will premiere its first new episode tomorrow (Oct. 14) at 9:30 p.m. EDT.